Restaurant for Two: a feature where I bring a friend to a restaurant and we write a review together. Lucky for me, I was able to bring TWO friends to Nando’s. Thanks to my partners-in-crime, Kira and Janelle, for joining me! 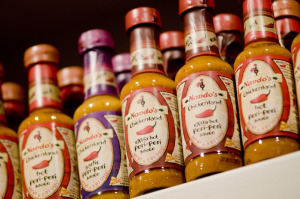 Nando’s PERi PERi may have over 1,000 restaurants worldwide, but they’ve only just broken into the US market. After establishing a pretty strong presence in the D.C. area, they decided to make Chicago their next stop after receiving countless requests from Chicagoans. On a trip to London, the students I traveled with convinced me that Nando’s was the place to be (apparently One Direction is in love with their food), so we made a special trek around the city in search of the official chicken of 1D, and boy were we glad we did! So, when I read that Nando’s was coming to Chicago, I was stoked. I went to their soft opening last year with friends and I was just as in love as when I’d gone in London. We tried a variety of dishes, each one more flavorful and yummy than the last. Let’s start with the name: PERi PERi is a Portuguese/South African blend of Bird’s Eye chili, spices, herbs, garlic, and lemon. 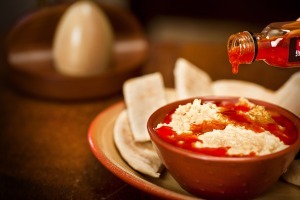 Nando’s marinates their chicken overnight and grills it made-to-order over an open flame. Whatever the secret is, PERi PERi chicken is moist and tender with spicy flavor. You can even choose the spice level of your sauce; from Extra Hot to Plain, there are six options, including my personal favorite – the sweet and tangy Lemon and Herb. Our favorite sides include the Macho Peas (pea mash with parsley, mint, and chili) and the PERi PERi Chips, which are fries rubbed down with the same delicious blend of spices that are used on the chicken. We also ordered the hummus with PERi PERi-infused oil drizzled on top; the oil added a distinctive flavor to the otherwise-ordinary hummus. One friend said that even the coleslaw made her mouth happy. My friends and I also dug into a couple of the salads and were most impressed with the Nutty Date Chicken Salad. Unlike the usual mayo-based chicken salad we find in the U.S., this shredded chicken was tossed in toasted almonds and dates and served with pickled onions and goat cheese. 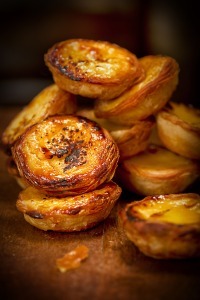 All of us are huge fans of dessert, so we were psyched to see Portuguese egg tarts (called Naughty Natas) on the menu. I lived in Hong Kong for two years which is really close to Macau (a former territory of Portugal) so egg tarts were abundant in the region. But, I have never had an egg tart quite like Nando’s! The flaky crust was buttery and rich, and the vanilla flavoring of the custard was perfection. I was stuffed when I finished the meal, but could’ve had at least three more tarts to go. And if the delectable food described above isn’t enough to make you hop on the Pink Line and run to Nando’s during your lunch hour, the friendly staff and unique, rustic decor may be the tipping point. Or, ya know – that large outdoor patio in the back could be the kicker. 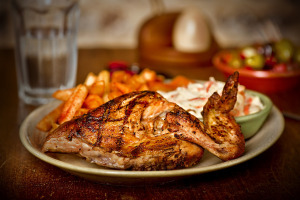 In short, Nando’s Chicago location gets two thumbs-up in our book. 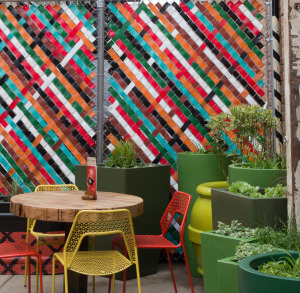 The minute you bite into one of those egg tarts while kicking back in Nando’s fab outdoor patio, I’m quite certain you’ll agree.